Where do I get good, accurate information on Information and Communications Technology (ICT) (web, software, mobile, electronic document) accessibility? Disappointingly, not from your local ‘big box’ store. Depressingly, not from mainstream online retailers and product review sites either. Promisingly, often provided by developers, manufacturers and service providers. In-Depth Answer: Where do I get good, accurate information on ICT (web, software, mobile, electronic document) accessibility? This article concerns finding out whether an available Information and Communications Technology (ICT) product is accessible. To find out how to make ICT products accessible, see our links to other sections of the Accessibility Switchboard project at the end of this article. This article is about the accessibility of mainstream ICT products that are designed for use by everyone, including people with disabilities. This article does not cover assistive technologies, and other specialist products designed for use only by people with specific disabilities. You’re going down to your local electronics shop or ‘big box’ store to buy a phone, a television, a computer, a gadget, or whatever is the latest ICT technology. The Americans with Disabilities Act (ADA) requires that the store is accessible to wheelchair users, welcoming of your guide dog, and won’t turn you away if you’re deaf. But there is no requirement that any of their staff know anything about the accessibility of the technology products sold, nor is there any requirement on them to provide such information along with other product specifications. This is disappointing, considering that the ADA secured the rights for you to get into the store over a quarter of a century ago. Mobile, computers, software, gadgets, etc. Are the accessibility features accurately listed? This is the same sort of thing as asking whether the screen resolution specifications are accurate? If you purchase a product and the specifications are incorrect, you should have the same recourse as if one of the other specifications was inaccurate. Again, if the company tackles accessibility holistically, if you contact customer support, you may reach someone who has been trained on the accessibility features of the products on offer. Are the accessibility features good? To put it another way, are the features well designed and easy to use by people with disabilities. Finding reviews of accessibility features among reviews of all features may be difficult to find on the manufacturer’s website. As stated above, in all likelihood this will also be hard to find among reviews posted on online retailer sites. It may be better to seek out discussion forums on disability access to technology on social media, and information sites from organizations representing the needs of people with disabilities. Note: For companies that sell products and services to the US Federal government, one of the primary means of conveying the accessibility of products is called the VPAT (Voluntary Product Accessibility Template). Many mainstream ICT vendors will post their VPATs on their websites, but these are usually located under headings like ‘government sales’ and ‘federal customers’. It is not likely that VPATs will be found under consumer-focused parts of their websites. The best way to find VPATs is to do an online search for the product name (and version number, if available) and the search term “VPAT”. There is also a list of vendors who have supplied direct VPAT links to the federal government. The list is named the “Vendor Accessibility Resource Center”. A common practice among mainstream companies is to put ‘footer’ information on their website’s home page. This includes things like usage policy, cookies, contact us, about the company, and so on. Increasingly, companies are adding accessibility information about their website among the other footer information. There isn’t a requirement to put this information on a site, so it could be that the company has made their site accessible, but not chosen to add the footnote. However, if they have included the footnote, then it is a good bet that they have endeavored to make their site accessible. Typically, for industry sites, this will mean stating that they follow the de facto standard for web accessibility, the Web Content Accessibility Guidelines (WCAG 2.0), at an A, AA, or AAA level. The A level is basic accessibility. AA is most common and considered by many to be adequate, and also readily achievable by competent web developers. AAA demonstrates a strong commitment to achieving high accessibility goals. As for whether the supplied information is accurate, there are means to test for accessibility that are commonly used in the accessibility field. Most typically, when the website is first overhauled to conform to published standards such as WCAG 2.0, the information will be accurate. What sometimes happens with organizations that do not take a holistic approach to accessibility, is that updates to the site are made by people who have not been trained in accessibility requirements. When this happens, new sections of the site and new posted content can start to show cracks in the company’s approach. The best way to keep on top of this is for the company to tackle accessibility as a strategic initiative. The only way to know if the site is indeed as conformant as stated, is to test it using available accessibility testing tools. Electronic documents can be made accessible, but there is no common equivalent to the ‘footer’ statement used on websites. There is no ‘rubber stamp’ as such for electronic documents. Having said that, if the company in question is posting a statement on their site to say that they are committed to accessibility on their site, and their site includes electronic documents, then those documents should also be accessible, in theory. The only practical way to find out whether a given electronic document is accessible is to (a) try reading it using assistive technologies; and/or (b) inspect the document using available accessibility testing methods. The problem with the former is that if you are reading a document that is half accessible (for example, the text is accessible, but the images are not), then you may not even know of the existence of the images, and not know that you are missing out on content. The problem with the latter is that it is mostly a specialist task to inspect documents for accessibility. We have produced Q&A articles for developers on How do I ensure my products work for people with disabilities? and What procedures should I use to test my ICT for accessibility? Other Q&A articles provide further answers to common questions. Other Guides include advice on how to integrate accessibility throughout an organization, notably A Roadmap for Organizational Accessibility for Large ICT Vendors. 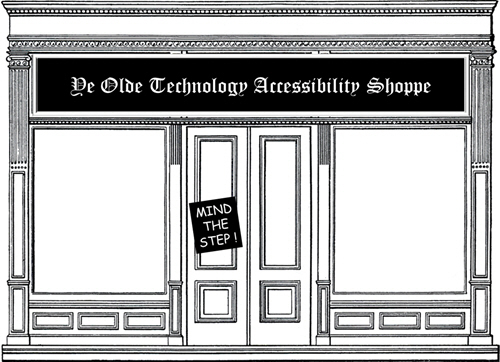 ‘Inaccessible Accessibility Shoppe’ by Chris Law & The Accessibility Switchboard Project. CC BY-SA 4.0.